It appears as if EVGA is deadset on taking complete control of every corner of the PC hardware market. Aside from being one of the top options in graphics cards and power supplies (as well as a host of other computer components) EVGA is now trying their hand at closed loop liquid coolers. Their new line of closed loop coolers dropped earlier this year and they currently have three AIO coolers to choose between: 280mm, 240mm, and 120mm. And, despite this being their first attempt at creating a closed loop cooler, their CLC series is already regarded as being one of the better options among AIO coolers. EVGA’s CLC line is based on the latest generation Asetek pump, which is used in some of the more popular options out there, including the Corsair H115i and NZXT Kraken x62. Below, we dive into each of the coolers and give you a look at what they have to offer, as well as point out who each cooler makes sense for. All three of the EVGA closed loop liquid coolers come in identical packaging (not considering their size). The boxes are really simple in their design, just a black sleeve around a cardboard box. On the top of the black sleeve, there is a brief overview of the specifications on the cooler, as well as some of its key selling points. When you pull off the black sleeve, the cardboard box underneath is designed essentially the same as the sleeve. It has EVGA’s logo on the front, as well as what size the cooler is. The top of the cardboard box is pretty much the same, too, in terms of layout. However, rather than listing features, it sticks strictly to the technical specifications of the cooler. Overall, the packaging on these coolers isn’t something that’s going to blow you away, but, of course, it’s plenty good enough and everything comes packed safe and secure. EVGA’s AIO coolers have one of the more distinct designs currently on the market and that is mostly due to the design of their fans, which come in a curved housing. The cooler also comes with Teflon Nano Bearing fans, which will contribute to a longer lifespan for the unit. The CPU blocks on these coolers have a bit different shape and design than their competitors as well. Where the Kraken x62 has a completely round block and the Corsair H115i has an octagonal block, the EVGA coolers go with a square block with rounded edges. The top plate on the block is transparent and sports the ‘EVGA’ logo. The logo is RGB friendly via the software that comes with the cooler and you can change it to match your build’s color scheme. The cooler comes with a USB cable that must be connected from your block to a USB header on your motherboard in order to control the RGB lights from the software. And, if you have the right EVGA video card, you can sync the LED colors of the logo on the block and on your graphics card. Other than the unique fan design and CPU block, this cooler is based on the same Asetek design used by other high-end closed loop coolers. So, while it looks a little different than the other options currently on the market, the base design and functionality is essentially the same as its most prominent competitors. The braided tubing contributes to a nice-looking cooler, but considering that most of the high-end closed loop coolers have braided tubing, it’s not really something that makes EVGA’s units stand out. While these coolers did not originally come with support for right out of the box (the AM4 brackets were available for free from the get-go, but you needed to order them separately), I can confirm that all three coolers now come with AM4 brackets. The copper-based plate on the bottom of the block comes pre-applied with thermal paste. However, no additional thermal paste is provided and so if you need to re-install the cooler in the future, you will need to purchase a tube of compound. Overall, being built on the latest Asetek design, the EVGA closed loop coolers have a solid base to work from. And, their unique fan and block design help these coolers differentiate themselves a bit from the competition. Of course, though, it’s temperatures and noise level that ultimately determine a CPU cooler’s true value. And, that is what we’ll look at right now. Before we get into the actual results of the tests that I ran on the coolers, I want to note that these results should not be used in comparison with the results you find in other benchmarks on these coolers. The reason is that, with different testing methodology and testing setups, results are going to vary. For instance, some reviewers may be testing their coolers on an i7-7700K. I tested these coolers on an i5-3570K (yes, it’s probably time for an upgrade… but she’s been soo good to me). Obviously, even if every other variable in the testing process was the same, our results will be different, because those processors run at different temperatures. And, unfortunately, since I didn’t have any of the competing coolers to compare EVGA’s coolers to, all my tests can really provide you with is a comparison of how the 280mm, 240mm, and 120mm versions stack up against each other. If you are looking for a super accurate comparison of how EVGA’s closed loop coolers compare against its competitors, check out Gamers Nexus’ review and benchmarks. I’m not sure if there are very many other reviewers out there who have as accurate of a thermal testing setup as they have. But, with that being said, there is some value that can be taken from the above numbers if you are contemplating on getting an EVGA cooler and you are wondering which one of the three options offers the best value for you (if any at all). To help you get a better idea of what the temperature readings above mean, it’s important to note that these numbers represent the temperature the processor was running at over the room temperature. This is important because, throughout testing, the room temperature varied significantly and if I didn’t take that into consideration, the final numbers would not accurately reflect the difference in performance. Also, rather than setting a specific fan speed, I used EVGA’s software to control the speed of the fans. And, using their fan speed slider, I tested these coolers at the max fan speed, the medium fan speed, and the lowest fan speed. This may not have been the ideal way to go about it, but I figured that a lot of users aren’t going to go into their BIOS to change their fan speed, and would be more likely to just change them in EVGA’s Flow Control Software. Finally, EVGA recommends using their coolers in an intake configuration, but through testing them out in my case, I found they actually performed better when the fans were set up to exhaust air out of the case. And, really, that’s just going to come down to what case you are using it in and how you configure your fans. But, it’s something that should be taken into consideration. Taking our benchmark into consideration, the main thing I’d like to point out is that you should take our results (and anyone other reviewer’s for that matter) at the system’s max fan speed with a grain of salt. This is because 99% of people who get one of these coolers will never choose to run their fans at max settings. The noise level is incredibly high when operating at the maximum fan speed. In fact, even at the medium fan speeds, the noise is probably higher than most will want to deal with. So, realistically, the benchmarks done at the lower fan settings are probably the real numbers you’ll want to compare if you are trying to decide between these three coolers. And, if you want to get an idea of what the fans sound like, be sure to watch the review video above to get an idea of what each fan speed sounds like. Still, though, at the lower fan speeds, the coolers all still perform very well. I think one thing that holds a lot of people back on choosing a closed loop cooler over a traditional air cooler is the installation process. However, EVGA’s liquid coolers were very easy to install. In fact, the process was on par with (or even easier than) some CPU fans I’ve installed in the past. So, if you’re worried about whether or not you’d have trouble installing one of these coolers or not, the process is not tough at all and is no more difficult than installing a power supply, or motherboard. Of the three closed loop coolers EVGA offers, the 280mm option is probably the best of the bunch in terms of price-to-performance as well as how it stacks up against its competition (based on other benchmarks). With a 280mm radiator, though, not everyone will have room in their case to accommodate such a big AIO cooler. And, with a price tag of just under $130, this option only really makes sense for those of you who are working with a large budget on your upcoming build, or for those of you who are looking to upgrade your current system to a higher-end cooler. In fact, I’d go so far as to say that if you don’t have a budget of over $1,000 (and probably even more realistically, $1,300 or higher), you should probably look for other options. Now, that’s speaking from a purely performance-based view. And, by that, I mean that at those budget ranges, adding a $130 cooler into your build is going to force you to sacrifice on the kinds of components that will have a bigger impact on your performance. This is as especially true when you consider that the difference in cooling performance between most high-end AIO coolers and budget-friendly air coolers is not that significant in the grand scheme of things. However, the difference in price between a budget-friendly air cooler and a high-end AIO cooler could be the difference between getting a GTX 1070 over a 1060, or a 1080 over a 1070. Whether or not you are willing to sacrifice system performance for aesthetics if you aren’t working with an extreme budget. Whether or not the case you have (or want) can accommodate a 280mm radiator. If your budget is large, or if you don’t mind sacrificing some performance for an AIO cooler, and you have a case that can accommodate a 280mm radiator, then this cooler is definitely worth considering. Taking the three factors laid out above in determining whether or not EVGA’s 280mm cooler is right for you, you can also use them to determine whether or not the 240mm version would be the right option for you. If you have a large budget, or you don’t mind sacrificing a bit of performance for something more aesthetically pleasing, and you want to choose a case (or you already have a case) that won’t accommodate a 280mm radiator (but will accommodate a 240mm radiator), then the 240mm version is the option for you. In terms of cooling performance, in our benchmark, the 240mm version tested a few degrees behind the 280mm version at the three different fan settings. And, while those few degrees look a bit pronounced on the graph, in terms of real-world performance, the difference is not too significant. The 240mm version does come in at about $20 cheaper than the 280mm version, so if you are looking to save a little bit of money, you could opt for the 240mm version. However, if you have the budget to accommodate a $110 cooler, I’m guessing you also probably have the budget to throw $20 more in to get a little bit better cooling. So, in my opinion, the 240mm version makes the most sense if you are going to choose (or already have) a case that won’t accommodate a 280mm radiator, but you still want to get a solid AIO cooler. Typically, 120mm closed loop coolers don’t get a lot of love in terms of the performance they offer compared with the price they come in at. The truth is that a lot of air coolers (both high-end and even some of the budget-friendly options) can offer comparable or even greater performance to these smaller AIO coolers, despite coming it at a significantly lower cost. So, while the EVGA CLC 120mm does a good job cooling your CPU, value-wise, it’s probably not the best option. Again, though, I do think that closed loop coolers offer superior aesthetics (and while aesthetics are going to vary from individual to individual, I’m sure I’m not the only one who believes this) and therefore a 120mm closed loop cooler like this one still has a place on the market. So, if you value aesthetics more than you do price-to-performance and you really don’t have the room or the budget to get one of the bigger CLC options, the 120mm version is definitely an option to consider. Until closed loop coolers can offer a significant performance advantage over more affordable air coolers that perform at similar levels, they will never be perfect options. However, closed loop coolers do offer great performance and, in my opinion, they typically look more attractive than most air coolers. With that being said, EVGA’s first run at AIO coolers is a pretty darn successful one. These units provide excellent cooling performance and have a nice-looking design that will help make your system stand-out. 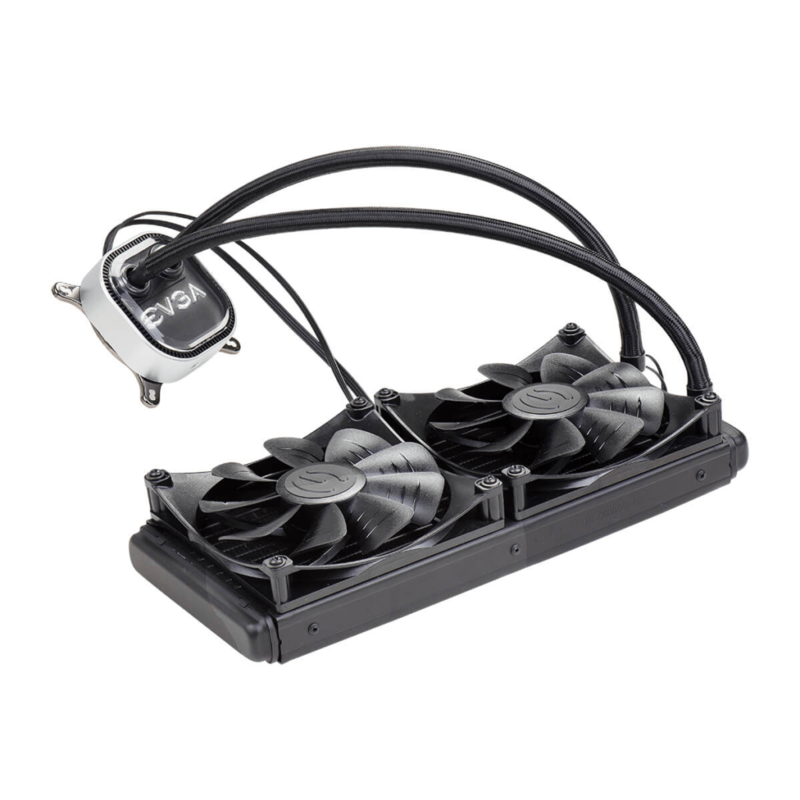 The main tradeoff with these coolers is, like all other AIO coolers, cost. If you are looking to build a new gaming computer under $1,000, these coolers probably won’t make sense for you. Even if you have a budget of $1,000-$1,300, you still might run into a situation where you’d have to sacrifice on components that will offer a bigger performance gain in order to fit one of these coolers in. However, if money isn’t an issue and you are looking for a high-end AIO cooler, EVGA’s coolers are definitely one of the options you should consider. As a result of our testing, we have added EVGA’s Closed Loop Coolers to our list of Best CPU Coolers. Check it out if you want to see more cooling options.